In Katy Perry’s song “Roar,” the protagonist sings “I got the eye of the tiger, a fighter, dancing through the fire, ‘cause I am a champion, and you’re going to hear me roar.” This ethos is a theme that emerged over and over again in our research on the subject of healthy living. Women aspiring to be champions, seeking motivational and inspirational advice on how they can live the best version of their lives that they can. However, no one succeeds on their own, and many brands offer products that aim to help women achieve their healthy lifestyle goals, so we wanted to explore the relationships that women have with brands overall as part of the POPSUGAR Insights 2014 Healthy Living Report, and we wanted to better understand how important it was for brands in certain vertical categories to offer products that help support a healthy lifestyle. 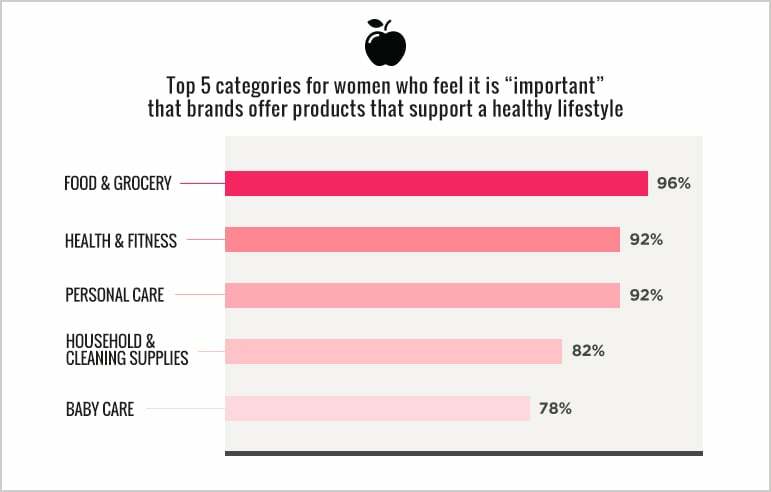 We asked women to rank vertical product categories on a scale ranging from “extremely important” to “not at all important” to understand which categories they felt it was important for brands to offer products that help support a healthy lifestyle. Overall, consumer packaged goods categories dominated this list, as understandably women are focused on the products that they put in their bodies, on their bodies, in their homes, or on their children. Also, 77% of women felt it was important that beauty (cosmetics) brands offer products that support a healthy lifestyle, followed by 68% for apparel and accessories, and 52% for carbonated beverages. An important aspect of this discussion is how brands should communicate the health benefits of their products. Based on our interviews, women felt that it was very important for brands to be connected to cause(s) and have an interest beyond just “selling” their products. Women felt that brands that want to play an active role in communicating key product health benefits should focus on community building and create short-form educational and instructional video content (such as TED talks). Women are seeking relevant and credible information. Brands can help provide the crucial facts and context women need, and together they can help women truly roar.